Scandyna adds AirPlay to SmallPod speakers | What Hi-Fi? 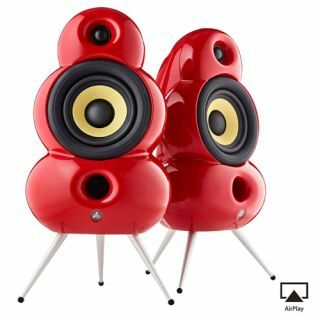 An AirPlay version of Scandyna's iconic SmallPod speakers will be unveiled at IFA 2013 in Berlin later this week, joining the aptX Bluetooth model already in the range. Available in gloss white, red or black, the SmallPod Air includes a 45W Class D amplifier and Kevlar drivers. A remote control comes as standard. The price is the same as for the Bluetooth version – £599 a pair. There's a 3.5mm input as well as AirPlay compatibility, and pre-orders on Amazon will start shortly. You'll be able to buy the SmallPod Air in the shops from November. Full specs for both speakers can be found on the new-look Scandyna website.